Said Ickle-me, Pickle-me, Tickle-me too. And off they go, into the wild blue yonder. Higher and higher and higher, eating mulligan stew and trying not to fall out. Airships manage to combine my love of boats and the romance of flying. I’d love airplanes if they weren’t perpetually designed for people shorter than 5’9″ and smell like old carpet. An airship, though, is like sailing, but in the sky. You’ve got the open air, a deck to stroll around, a wonderful view, and your own cabin/hammock to sleep in when you need a nap. They probably even have a cook or a galley. Then off you go, wherever you want, to have adventures of whatever kind you can manage. Now, there are a variety of practical concerns with the idea of airships as ‘sailboats in the sky’. Chiefly, their main problem is how to steer if you’re using windpower to ‘sail’ through the air. The only thing that keeps a sailboat from going sideways is a keel or centerboard of some kind, but you can’t do that on an airship and have it work, since it isn’t interacting with a second medium (like the water or the ground) to keep it pointed in a particular direction. Blimps are only steerable because they use mechanical engines to propel them and then use fins to direct the flow of air over their hulls. 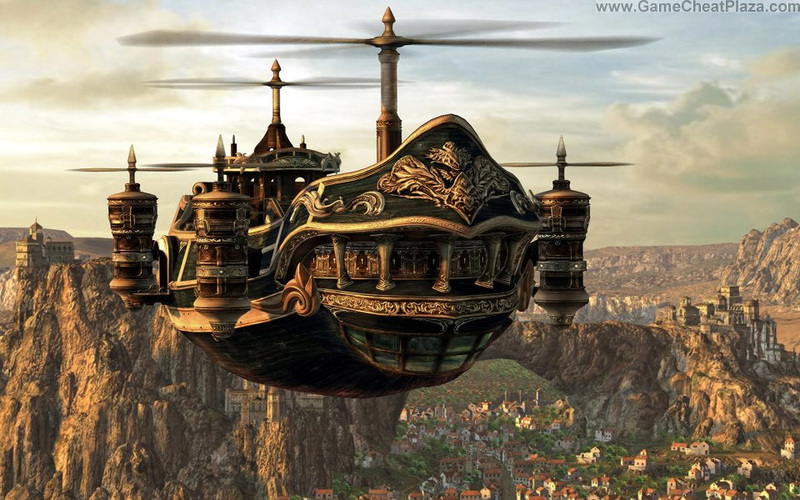 Honestly, the Final Fantasy airships, with their helicopter-like propulsion model, seem the most practical in the fantasy setting. In the real world, though, we once had dirigibles. Zeppelins. The great leviathans of transatlantic flight. It is a real shame the Hindenburg (and the US’s decision to keep the world’s helium to itself through the 30s/40s/50s) had to ruin that mode of travel. Yeah, it might take longer, but for those of us who sometimes like to travel for the journey itself, an airship gracefully floating across the Atlantic, like a cruise ship in the air, would be a real treat and would beat the hell out of those damned sardine-can airplanes they shoe-horn you into. I’d even bet they’re more fuel-efficient (or could be made so), since their engine power doesn’t need to keep them aloft so much as keep them moving. Heck, with inert helium as a lifting force, they’d be rather unlikely to crash. They could drift, certainly, but they wouldn’t be dropping from the sky like a stone. In any case, the time of the zeppelin is past and, with the world’s supply of helium dwindling rapidly, it is unlikely to return. I curse my luck a bit at this and am filled with jealousy everytime I see Indy and his dad fleeing Germany aboard a zeppelin in the Last Crusade. Posted on July 26, 2012, in Critiques, Theories, and Random Thoughts and tagged airships, fantasy, Final Fantasy, helium shortage, Indiana Jones, Shel Silverstein, zeppelins. Bookmark the permalink. 2 Comments. Never read any, to be honest. William Gibson and Bruce Sterling wrote The Difference Engine, which is one of the defining books of the genre, but I know just about nothing about it, including whether it’s any good or not.